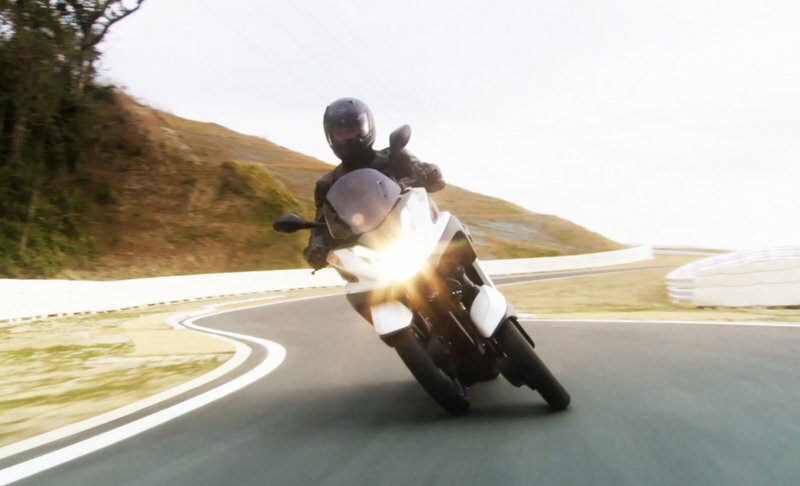 Not yet available in the U.S., the 2015 Yamaha Tricity is all about innovation and engineering. In developing this three-wheel scooter, project leader Kazuhisa Takano — who was part of the development team for race machines like the YZR500 and the YZR-M1 — used not only computer simulations, but also mock-ups with chopsticks and paper models for his team to come up with the parallelogram-link mechanism. It’s this intricate mechanism that gives the Tricity its agile cornering ability, unlike the bulky hulk of other three-wheel rides. 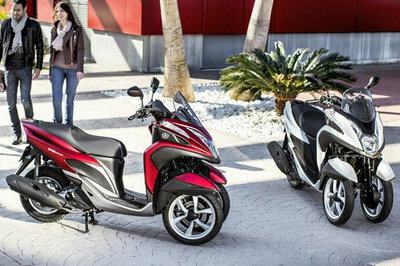 Race technology also gave the Tricity its natural, linear movement, and the nearly 50:50 weight distribution between the front and rear wheels makes this handle more like a motorcycle than a scooter. Designed with the short-distance commuter in mind, the Tricity has sporty styling that will carry you through rush-hour traffic with ease. 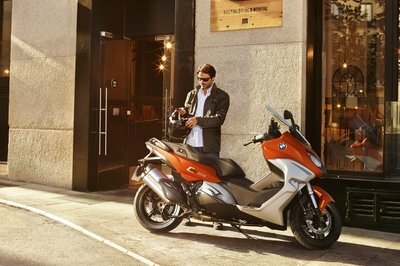 With enough storage space under the seat to stow a full-face helmet, this is could be your everyday ride. 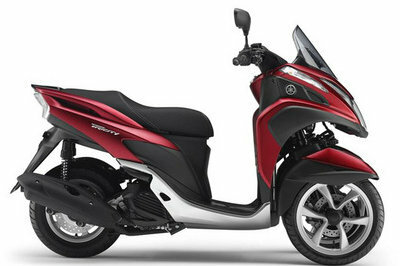 Tricity has the ease of handling to accommodate first-time riders, and with the engine coming at under 125 cc, you only need an A1 license to ride it. Instrumentation is simplistic, with an LCD display, including a fuel meter, clock and outside temperature meter. According to Giovanna Camisa, a member of the Tricity product planning group, riding enjoyment was a main goal in the project and they’ve hit the mark. 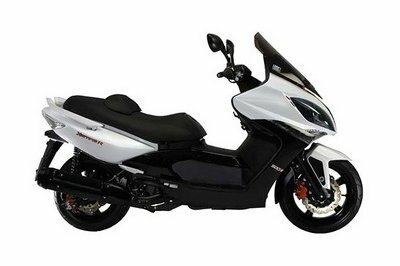 The parallelogram-link mechanism makes this chassis work, allowing you to lean into the corners as you would with a two-wheeler. The weight distribution and narrow width gives you an easy and natural riding feel. 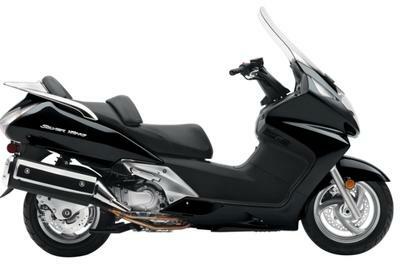 With telescopic forks in the front and unit swing suspension in the rear, you get a comfortable ride. Drawing on feedback from first-time riders on scooters or motorcycles, the team created a scooter to set a new standard in personal transportation. 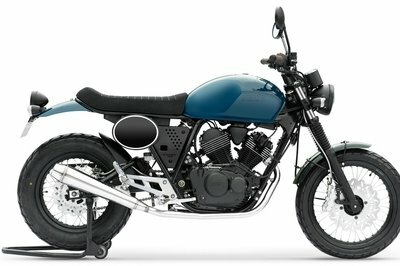 The fuel-injected, single-cylinder, 124.8 cc, liquid-cooled, four-stroke engine combined with the V-belt automatic transmission delivers 8.1 kW at 9,000 rpm and 10.4 Nm at 5,500 rpm to give you a zippy ride through the powerband. 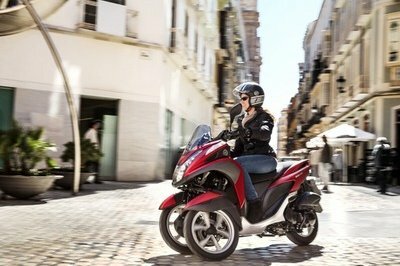 The long-stroke, two-valve engine was designed for good acceleration from low speeds, and since this is meant to be a city ride, city speeds is where you’ll spend most of your time on this economical commuter. The Tricity comes in at £3,399, and is available in Anodized Red, Mistral Grey, Competition White or Midnight Black. That is well within reach for a fun ride to work everyday. My husband and fellow writer, TJ Hinton, says, "This is an interesting-looking scooter. I wouldn’t necessarily want to own one, but I would love to get my hands on one and see how the front steering suspension does what it does." "With years of experience in the mechanical side of things, I really appreciate the parallelogram-link mechanism that allows you to lean into the corners and still keep both front wheels in firm contact with the road. 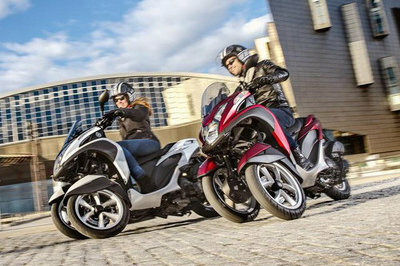 You get the stability of a three-wheeler with the intuitive handling of a two-wheeler."